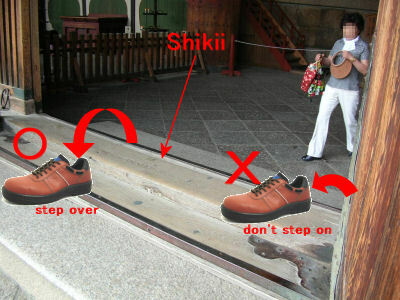 Don’t step on the threshold of Buddhism temple. We have to cross the threshold. Japanese have word, it says “Shikii wo matagu (cross the threshold)”. If the scale of temple is large, threshold is also large and high. So, it’s hard to cross the threshold. Japanese says that “Shikii ga Takai (threshold is high)”. For that reason, this word (Shikii ga Takai) became an idiomatic expression. It means difficult problem, hard to overcome. 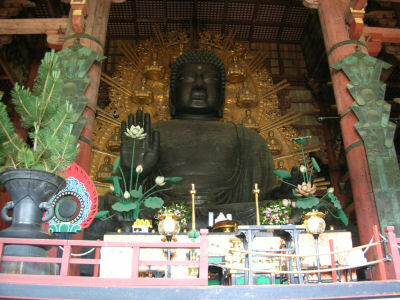 The world biggest copper Buddhism statue exists at Todai-ji temple in Nara.